Not all Bible verses about hell actually use the word "hell" in the verses. Jesus used "hell" fifteen times (in the KJV) but He also used other words to describe hell, for example: destruction, outer darkness, world to come, furnace of fire, everlasting fire, weeping and gnashing of teeth, thrust out, where fire is not quenched and chains of darkness. Some people like to say that "hell is not real". My personal opinion is they do this to comfort themselves because of the unrepentant lifestyle they lead. What they need is the real Comforter, who will provide all the comfort they need, in their time of need. Here are some Bible verses about hell. Bible Verses about Hell - what Jesus said! But I say unto you, That whosoever is angry with his brother without a cause shall be in danger of the judgment: and whosoever shall say to his brother, Raca, shall be in danger of the council: but whosoever shall say, Thou fool, shall be in danger of hell fire (Matthew 5:22). And if thy right eye offend thee, pluck it out, and cast it from thee: for it is profitable for thee that one of thy members should perish, and not that thy whole body should be cast into hell (Matthew 5:29). Enter ye in at the strait gate: for wide is the gate, and broad is the way, that leadeth to destruction, and many there be which go in thereat (Matthew 7:13). And I tell you this, that many Gentiles will come from all over the world—from east and west—and sit down with Abraham, Isaac, and Jacob at the feast in the Kingdom of Heaven. But many Israelites—those for whom the Kingdom was prepared—will be thrown into outer darkness, where there will be weeping and gnashing of teeth" (Matthew 8:11-12 NLT). 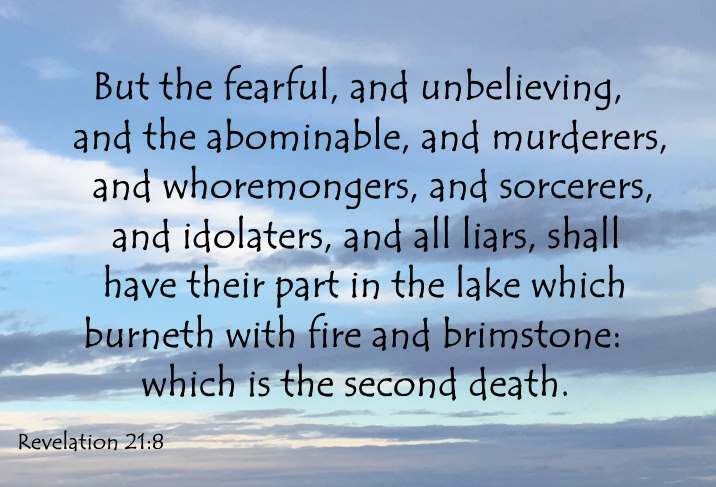 And fear not them which kill the body, but are not able to kill the soul: but rather fear him which is able to destroy both soul and body in hell (Matthew 10:28). And whosoever speaketh a word against the Son of man, it shall be forgiven him: but whosoever speaketh against the Holy Ghost, it shall not be forgiven him, neither in this world, neither in the world to come (Matthew 12:32). And shall cast them into a furnace of fire: there shall be wailing and gnashing of teeth (Matthew 13:42). Again, the kingdom of heaven is like unto a net, that was cast into the sea, and gathered of every kind: Which, when it was full, they drew to shore, and sat down, and gathered the good into vessels, but cast the bad away. 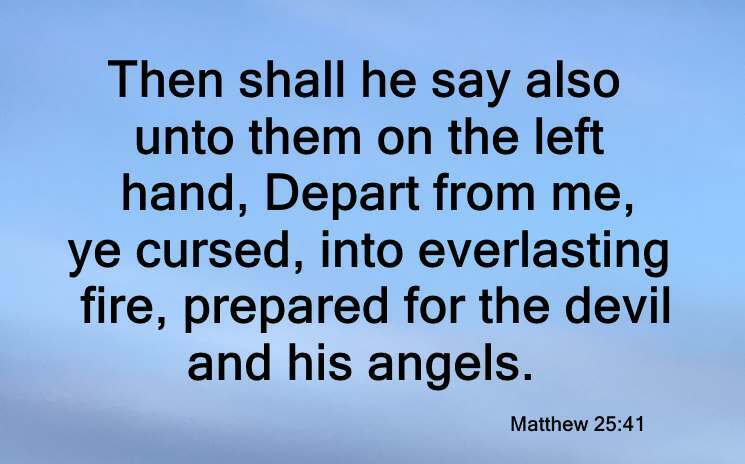 So shall it be at the end of the world: the angels shall come forth, and sever the wicked from among the just, And shall cast them into the furnace of fire: there shall be wailing and gnashing of teeth (Matthew 13:47,48,49,50). Ye serpents, ye generation of vipers, how can ye escape the damnation of hell (Matthew 23:33). When the Son of man shall come in his glory, and all the holy angels with him, then shall he sit upon the throne of his glory: And before him shall be gathered all nations: and he shall separate them one from another, as a shepherd divideth his sheep from the goats: And he shall set the sheep on his right hand, but the goats on the left .... Then shall he say also unto them on the left hand, Depart from me, ye cursed, into everlasting fire, prepared for the devil and his angels .... And these shall go away into everlasting punishment: but the righteous into life eternal (Matthew 25:31,32,33,41 & 46). And if thy hand offend thee, cut it off: it is better for thee to enter into life maimed, than having two hands to go into hell, into the fire that never shall be quenched: Where their worm dieth not, and the fire is not quenched. And if thy foot offend thee, cut it off: it is better for thee to enter halt into life, than having two feet to be cast into hell, into the fire that never shall be quenched: Where their worm dieth not, and the fire is not quenched. And if thine eye offend thee, pluck it out: it is better for thee to enter into the kingdom of God with one eye, than having two eyes to be cast into hell fire: Where their worm dieth not, and the fire is not quenched (Mark 9:43,44,45,46,47,48). But I will forewarn you whom ye shall fear: Fear him, which after he hath killed hath power to cast into hell; yea, I say unto you, Fear him (Luke 12:5). Strive to enter in at the strait gate: for many, I say unto you, will seek to enter in, and shall not be able. When once the master of the house is risen up, and hath shut to the door, and ye begin to stand without, and to knock at the door, saying, Lord, Lord, open unto us; and he shall answer and say unto you, I know you not whence ye are: Then shall ye begin to say, We have eaten and drunk in thy presence, and thou hast taught in our streets. But he shall say, I tell you, I know you not whence ye are; depart from me, all ye workers of iniquity. There shall be weeping and gnashing of teeth, when ye shall see Abraham, and Isaac, and Jacob, and all the prophets, in the kingdom of God, and you yourselves thrust out (Luke 13:24,25,26,26,27,28). There was a certain rich man, which was clothed in purple and fine linen, and fared sumptuously every day: And there was a certain beggar named Lazarus, which was laid at his gate, full of sores, And desiring to be fed with the crumbs which fell from the rich man's table: moreover the dogs came and licked his sores. And it came to pass, that the beggar died, and was carried by the angels into Abraham's bosom: the rich man also died, and was buried; And in hell he lift up his eyes, being in torments, and seeth Abraham afar off, and Lazarus in his bosom. And he cried and said, Father Abraham, have mercy on me, and send Lazarus, that he may dip the tip of his finger in water, and cool my tongue; for I am tormented in this flame. But Abraham said, Son, remember that thou in thy lifetime receivedst thy good things, and likewise Lazarus evil things: but now he is comforted, and thou art tormented. And beside all this, between us and you there is a great gulf fixed: so that they which would pass from hence to you cannot; neither can they pass to us, that would come from thence. Then he said, I pray thee therefore, father, that thou wouldest send him to my father's house: For I have five brethren; that he may testify unto them, lest they also come into this place of torment. Abraham saith unto him, They have Moses and the prophets; let them hear them. And he said, Nay, father Abraham: but if one went unto them from the dead, they will repent. And he said unto him, If they hear not Moses and the prophets, neither will they be persuaded, though one rose from the dead (Luke 16:19-31). The Lord preserveth all them that love him: But all the wicked will he destroy (Psalm 145:20). The way of life is above to the wise, That he may depart from hell beneath (Proverbs 15:24). Hell and destruction are before the Lord: How much more then the hearts of the children of men (Proverbs 15:11)? Because thou wilt not leave my soul in hell, neither wilt thou suffer thine Holy One to see corruption (Acts 2:27). And to you who are troubled rest with us, when the Lord Jesus shall be revealed from heaven with his mighty angels, In flaming fire taking vengeance on them that know not God, and that obey not the gospel of our Lord Jesus Christ: Who shall be punished with everlasting destruction from the presence of the Lord, and from the glory of his power (2 Thessalonians 1:7-9). Even as Sodom and Gomorrha, and the cities about them, in like manner giving themselves over to fornication, and going after strange flesh, are set forth for an example, suffering the vengeance of eternal fire (Even as Sodom and Gomorrha, and the cities about them, in like manner giving themselves over to fornication, and going after strange flesh, are set forth for an example, suffering the vengeance of eternal fire (Jude 7).